Howdy, and Welcome to the Sheep Wagon Days website. Although it isn't quite as exciting as coming to the Sheep Wagon Days themselves, there is plenty to see and do here. Sheep Wagon Days started as a way to keep the rich history of the sheep industry in the area alive. Not much has changed in that respect. We strive to share the history in a very hands-on approach with each visitor that we are lucky enough to meet. Sheep Wagon Days was started in 1999. In 2006 it almost ended. Now it's 2008 and we are looking forward to continuing to expand the event each year. We pride ourselves in keeping the festival grounded in the deep traditions of the sheep industry while providing a fun and educational event for the whole family. I hope you enjoy this years event so much that you just can't wait to come back! And when you do come back...be sure to bring your friends. See you each year in September! Having grown up in Northwest Colorado, fourth generation to several early Homesteaders, the rich heritage of the area has always intrigued Melody. When she married into a sheep business she became more intent on sharing the history of the family as well as the industry. 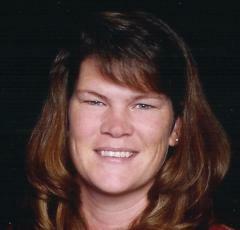 The Villard family has helped with Sheep Wagon Days for years. When the event was under the threat of being canceled, Melody took the project on. With more and more generations being raised away from the farm, agriculture education is very important to the industry. Strong family roots in shepherding and fifteen years in the business with her husband has lead to a passion for sharing. Art Unsworth has become "the Voice of the Meeker Classic", over the course of the last nine years. His uniquely British pronunciation of "schedule" is the first clue that he is Canadian. His smooth delivery, knowledge of stockdog trialing, and flare for humor make him a delightful host for not only the Meeker Classic but also a perfect fit for Sheep Wagon Days. .Art's grandfather left England for Ontario in 1894, and two years later he moved by covered wagon with his family 3,500 miles west to settle in Oregon. In Oregon he built a ranch of purebred Clydesdale Horses with a flock of 4,000 sheep. 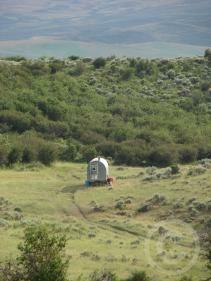 Unexpected tragedy caused the Unsworth family to leave Oregon by covered wagon in 1906 for the Canadian Prairies. There, on Bear Creek, Art and his fifth generation sons still work the Twin Bridges Ranch Ltd.
Art's gift of gab started his career as an Announcer as a very young man. He first competed and later Announced rodeos including the 109 year old Murraydale Stampede in the hills. By the mid-1970's Art was specializing in Announcing sheepdog trials. He's been the "voice" of the Western Canadian Nationals, the Canadian Nationals, and the famous Calgary Shoot-Out Stockdog Challenge. He also works as an event organizer and Announcer for the Maple Creek Open and Baxter Black Western Entertainment, as well as Announcing Canadian Western Agribition plus several regional sheepdog trials. Art wears many hats, but his primary focus has been raising his two sons Chris and Clint at the family Ranch. Art also coaches with a very successful Provincial Basketball program, along with officiating college / high school Basketball games. The "Twin Towers" are now playing College Basketball and Football, so only find time to help out on the family ranch during the off season. We're privileged to have this caliber of talent, to keep the Event flowing smoothly back again this year at Craig's Sheep Wagon Days. Dave Glad - Heathen Highlander Bagpiper - Extraordinare! Dave has been playing the bagpipes for about twenty years. 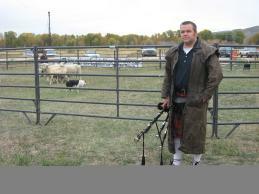 He has been a corps piper in The Salt Lake Scots Bagpipe Band and is one of the organizers of the Heathen Highlanders. In 1994 Dave competed in the World Pipe Band Championships in Glasgow Scotland. Dave has been the piper for hundreds of events. "I’ve been playing the highland bagpipes for most of my life. I was taught as a young boy by Dennis McMaster, former pipe major of the Salt Lake Scots Bagpipe Band. I played as a competitive bagpiper for many years and won several solo and pipe band competitions in the Western United States Pipe Band Association. In 1994 I traveled with the band to Glasgow Scotland to compete in the Bagpipe Band World Championships. What a great experience! I left the Salt Lake Scots Bagpipe Band in 1999 and went on to pursue other opportunities. I have performed at just about every kind of event imaginable and had a lifetime of great experiences as a musician and performer. I’ve shared the joy at weddings and parties with my clients, and I’ve mourned with them at funerals of their loved ones. I’ve been honored to provide bagpiping services for the memorials of veterans, fire fighters and law enforcement officers. All true American heroes. This is my legacy as a bagpiper… One that I will continue. If you would like to hire a Bagpiper for your event please contact me @ 801-661-4168"